Regan A. R. Gurung is an award-winning professor of human development and psychology at UW-Green Bay. His research focuses on questions surrounding teaching and learning as well as on clothing and perception and the role of culture and health. Gurung joined the University in 1999, and has held the prestigious Ben J. & Joyce Rosenberg Professorship since 2010. In May 2017, he was awarded the Charles L. Brewer Distinguished Teacher of Psychology Award from the American Psychological Foundation. Read his full bio. Below are his (paraphrased) remarks to the graduates and guests. The full video of the commencement celebration will be available for viewing for a limited time. A long time ago in what seemed like a galaxy far, far away… I sat exactly where you are. And remember… nothing, except worrying I would trip climbing the stage. ONE: Find your Champion. At UW-Green Bay we make champions. We are your champions, even after you graduate. But sometimes you first have to find yours. There will be challenges. As I watched Star Wars, those years ago, an American college education was not a possibility. No one in my family went to college. We did not have enough money for it. But I had a champion. An alumna supported me. Find your champion and remember that most battles are easier fought with backup. TWO: Be someone’s Champion. We get so focused on our selves that it is often hard to go beyond your own needs. Look outside yourself. Look to your friends, your family, the community. These are not the best of times. The Pack is 7-6. Seriously though. There are troubles in the world, in America. Politics. Scandals. Feel powerless? Start small. Start local. I hope you stay here and help the city, the county, the region. Be a champion to your friends and to your community. Use your power. Knowledge IS Power. Flex your interdisciplinary muscles. UW-Green Bay has given you a lot. Use it. Not sure what interdisciplinarity is? My take: Multiple perspectives, better solutions. Use your education to make your life and the life of those around you epic. You can do it selflessly — As Harry Truman said — “It is amazing what you accomplish if you do not care who gets the credit.” Or maybe you do not want to be modest. As the 19th century Dutch Botanist De Vries said: “Modesty is a virtue yet one gets further without it.” Especially as you are interviewing for a job. Give them everything you’ve got. Throw your interdisciplinarity at them. THREE: Be Savvy. We are surrounded by people making claims. What’s fake news, what’s real? Social media says “research shows” all the time. Should you believe it? One of the most important parts of our mission is critical thinking. Don’t blindly accept what you read or hear. Every time I see a headline a voice in my head yells ‘SHOW ME THE DATA!’ Try it. 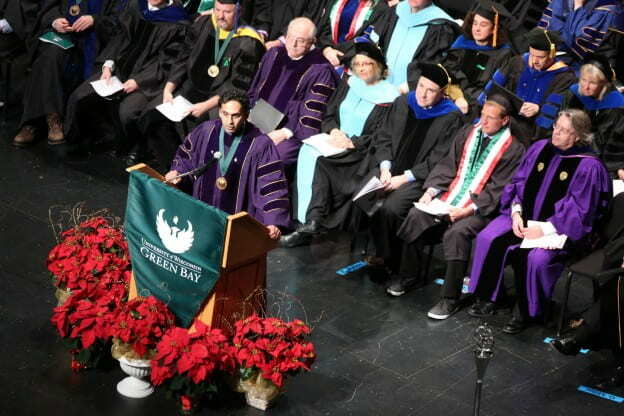 College education is important — 98% of UWGB graduates get job placement. How’s that data for you? And FIVE: Chill, Drill, Build. This is a biggie. When you feel angry or stressed, take some time out and CHILL. Give your biology some time to adjust. DRILL — we have many automatic thoughts and behaviors that are unhealthy. Practice healthy ones. Practice, practice, practice. Finally, BUILD your social networks. You’ve got friends, family. Social support is one of the most powerful tools you can have. Build and take care of your social networks. Knowledge is power, and with education is a powerful force. 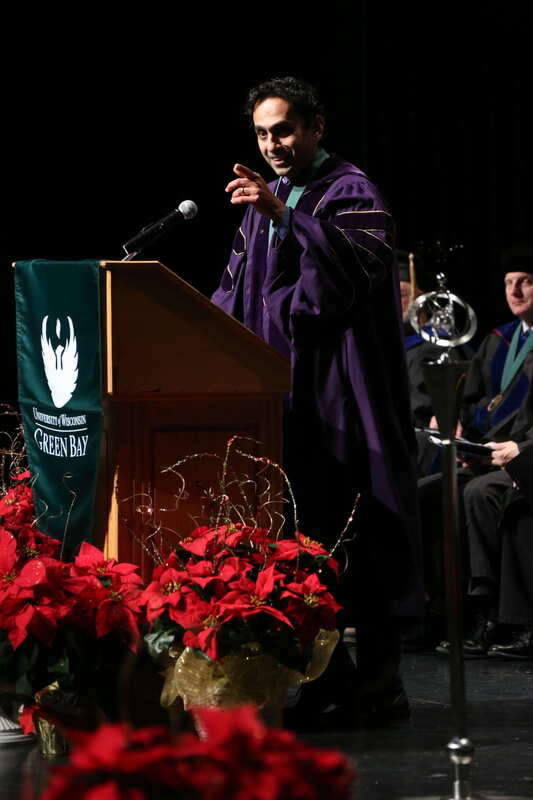 Your time at UW-Green Bay has given you the power. As you leave here, may the force be with you. All the best and may your life be epic! This entry was posted in Leading & Learning and tagged CAHSS, commencement, Human Development, Provost, Psychology, Video on December 16, 2017 by Sue Bodilly.